The latest update of Microsoft, Windows 10 is out. It has already become a craze among the users especially the youth. Everyone, especially the Students and the programmers and are busy exploring it. Programmers use different compilers for their work but most students still use turbo c++ compiler for their studies. A lot of people asking me how to install Turbo C/C++ on windows 10 since they all are facing the same compatibility issue . 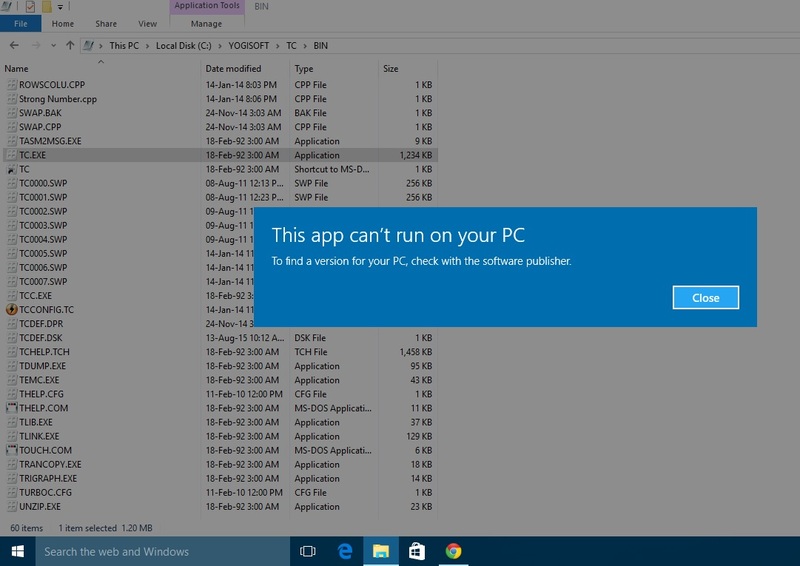 “This app can't run on your PC. 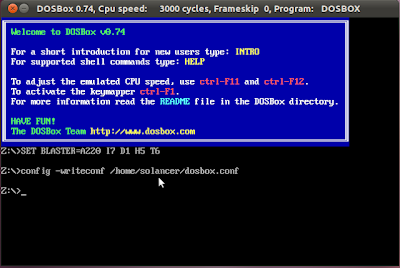 After a ton of trial and testing I found that Dosbox could run it as like the old dos, however it had a few issues like key-mapping that clashed with easy routes of Turbo C++. For the sake of simplicity I created totally new installer for installing Turbo C/C++ on any version of Windows . It Completely based on Dosbox so I wanna give a big thanks to DosBox developer for creating such a nice emulator for latest version of windows. 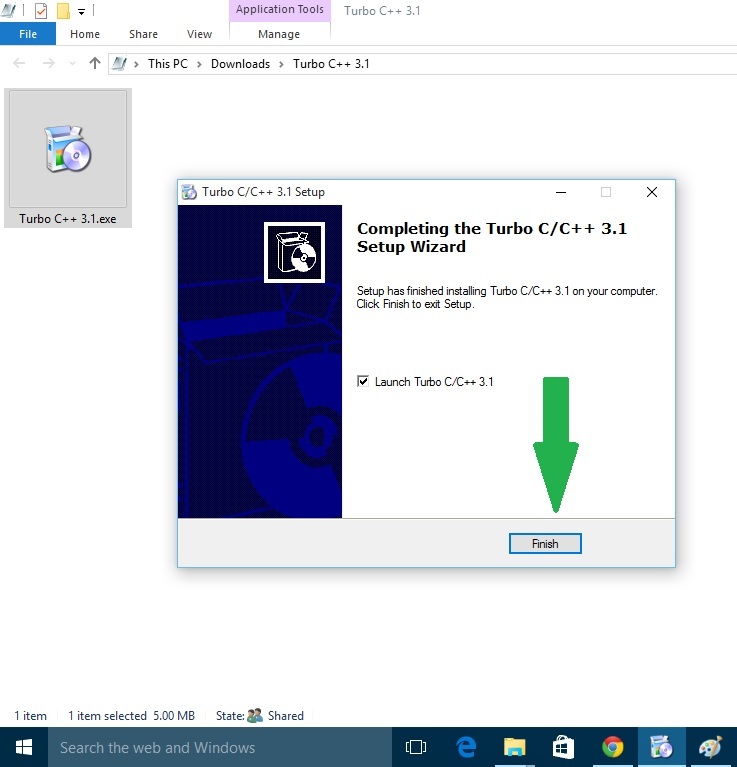 So here I'm going to show a tutorial on how to install Turbo C/C++ on Windows 10. IMPORTANT - Don’t change the default installation directory “C:\YOGISOFT” . 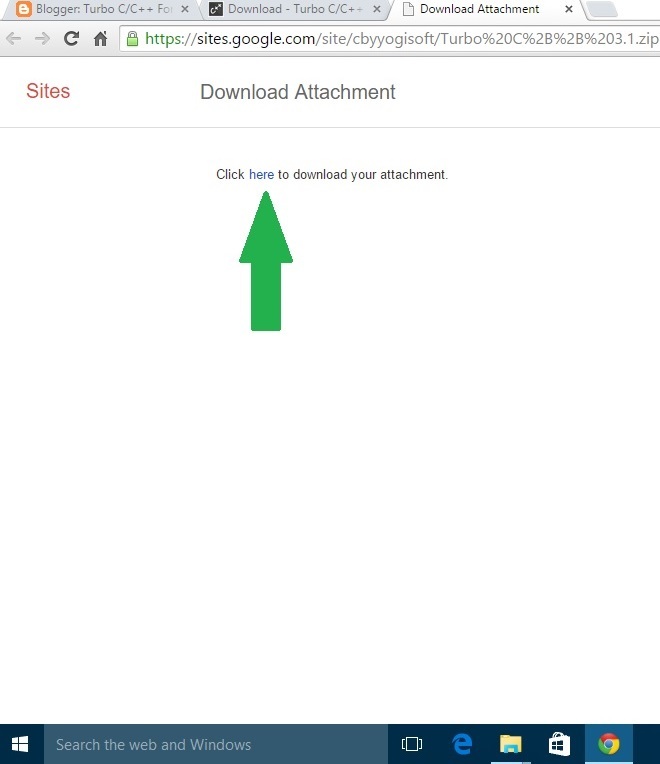 Step 2) Click on Direct Download Link . 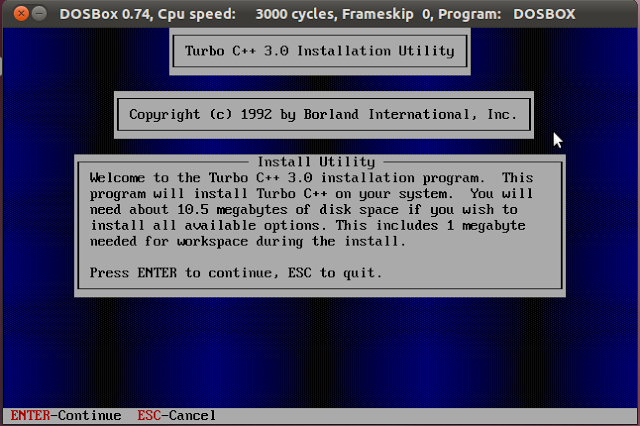 Step 3) A zip file named Turbo C++ 3.1.zip will be downloaded. Step 4) Right Click on Turbo C++ 3.1.zip and Left click on Extract All. 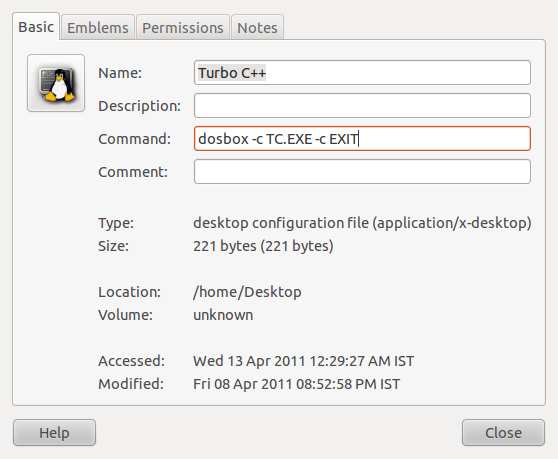 Step 5) Click on Extract and then Double click on Turbo C/C++ 3.1.exe. 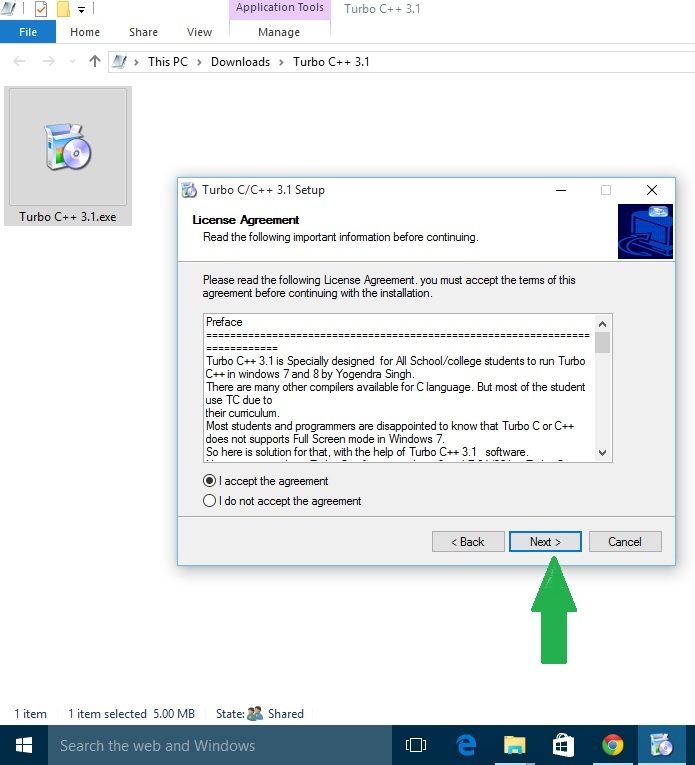 Step 6) Accept the License Agreement and click on next - next - Finish. Step 7) Complete the rest of the process and don't forget to check launch Turbo C/C++ 3.1. Turbo C/C++ 3.1 is designed in a way that we don’t need to configure anything. 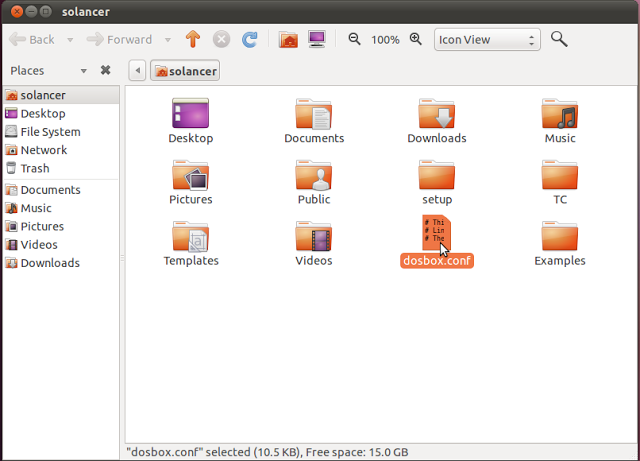 It is one click installer. No need to type complicated mounting command every time to just booting up the turbo C.
Use "CTRL + F9" for Compile and Run. It supports graphics code and full screen feature is also enabled which is generally not supported by many other compilers. 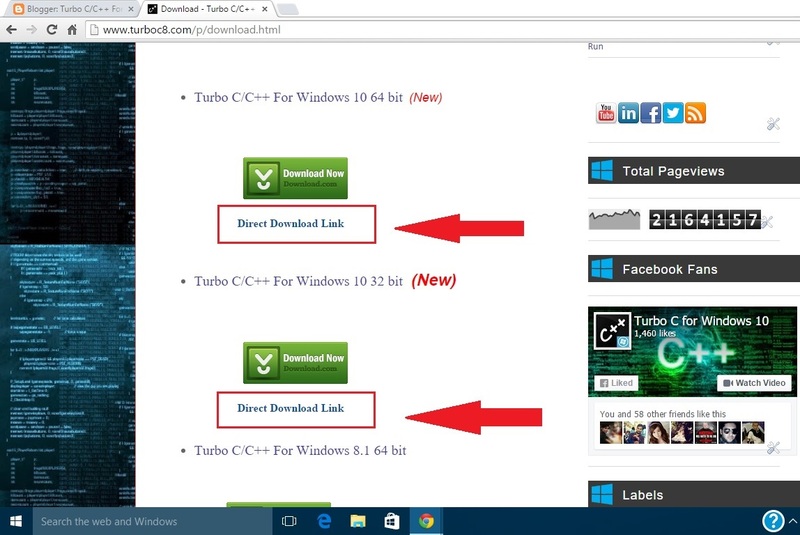 For more Clarification Watch below video tutorial, step by step procedure is explained to install turbo c+ on Windows 10 64/32 bit. If you have facing any Problem during installation procedures feel free to comment below! This post is extraordinarily devoted to the individuals who was requesting Top best GUI (Graphical User Interface) based Turbo C/C++ 3.0 Compiler IDE (Integrated Development Environment) Alternatives. As we all know that Turbo C/C++ 3.0 was the king of coding in 19's .Turbo C is an Integrated Development Environment (IDE) and compiler with pre loaded Editor for the C programming coding from Borland. Initially presented in 1987, it was know as its speciality of little size, quick arrange speed, complete manuals and low cost. As we all had completely takes a shot at our most loved legendary Turbo C/C++ Compiler, I called it most loved in light of the fact that its the only compiler when 19's gentlemen begin coding on blue screen and taking steps in the C/C++ language . WHY?? We need New Compiler !!! Turbo C/C++ is a 16 bit compiler!! , and all present Operating System are running on Architecture of either 32 bit or 64 bit. The greatest measure of memory that a Program/Project can utilize on Turbo C/C++ is 2^16 = 64 KB, which is less as contrasted with current projects! Turbo C/C++ 3.0 does not support modern casts - only C-Style casts. You can never take in the ideas like exemptions, Template based libraries (which are currently at the heart of C++ ) like with Turbo C/C++. Ugly GUI !!!! - its like dos based console.
" So for the amendment of these above disadvantages of Turbo C/C++ we are proceeding to list the Top 5 best Turbo C/C++ Great GUI based Alternatives "
Code::blocks is a free C, C++ and Fortran IDE constructed to help its clients. It is intended to be exceptionally extensible and completely configurable. At last, an IDE with all the peculiarities you need, having a steady look, feel and operation crosswise over stages. Manufactured around a plugin system, Code::blocks could be stretched out with plugins. Any sort of usefulness might be included by introducing/coding a plugin. For example, ordering and debugging usefulness is as of now given by plugins! 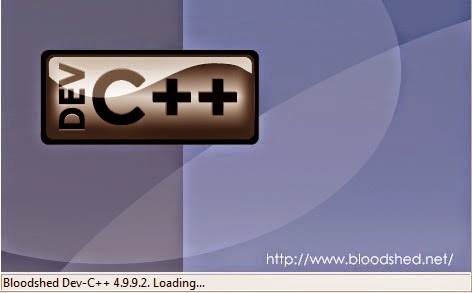 Decently Bloodshed Dev C++ is a full-offered Integrated Development Environment (IDE) for Learning C/C++ programming dialect on windows working framework. Dev-C++ is Free Software circulated under the GNU General Public License. 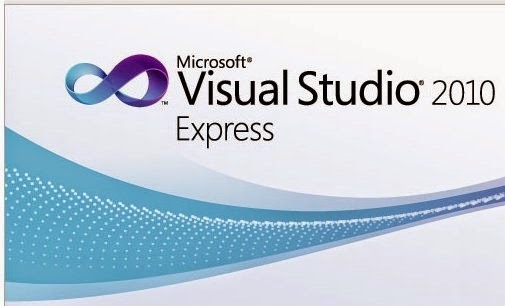 Microsoft Visual Studio Express offers compelling advancement instruments for all ability levels and gives you a chance to outline incredible looking and simple to-utilize applications utilizing a natural move and customize interface originator. Express Edition items are intended for hobbyists, understudies, and beginner designers. In that capacity, they fail to offer the full broadness of gimmicks found in higher-end Visual Studio. The client interfaces are altogether streamlined to guarantee that incidental gimmicks don't meddle with the learning methodology. C-Free is an expert C/C++ integrated development environment (IDE) that backing multi-compilers. Utilization of this product, students can alter, construct, run and debug programs. With C/C++ source parser included, albeit C-Free is a lightweight C/C++ advancement device, it has influential peculiarities to give you a chance to make utilization of it in your undertaking. *If you have facing any Problem during Downloading or found any broken Links Please let me know by comment below! The target of this article is to help C++ learners to run Turbo c++ under Ubuntu (Linux) O/s. Turbo c++ is a quite generally utilized compiler for C and C++ in most Indian schools and universities/colleges (SPECIALLY DELHI UNIVERSITY). Despite the fact that there are numerous different compilers like Eclipse Cpp (not to be confounded for Eclipse IDE for Java), CINT and so on accessible on the house and offer better functional and intriguing IDE characteristics, numerous schools and universities are even now utilizing Turbo c++ which is an old fashioned compiler. As scholars are never presented to such new engineering upgrades, they are not sure about utilizing most recent C++ compilers. The excuse for why Turbo C++ can't run under Ubuntu is in light of the fact that turbo C++ is constructed for Dos. Yet there is a method for doing it. 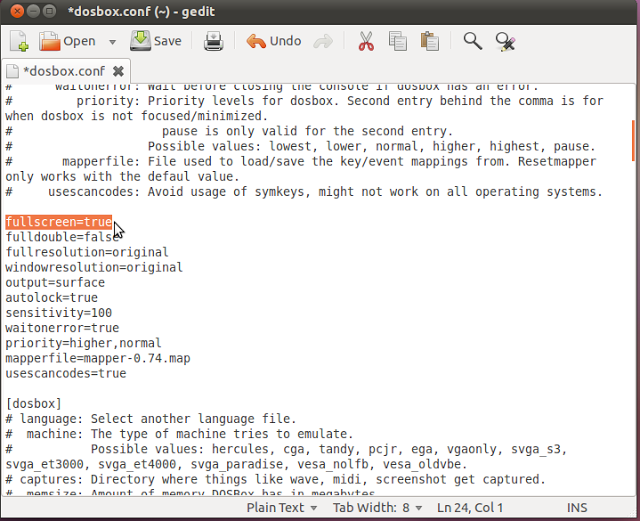 The answer for this issue is utilizing Dosbox, which is a Dos emulator for Linux O/s. 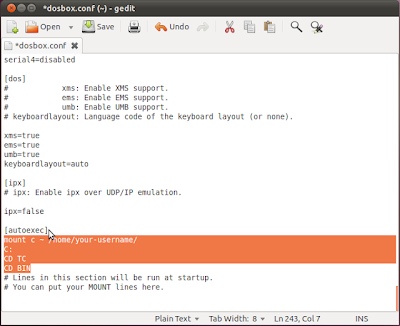 Dosbox has a repution of being extremely light and stable emulator for Dos based projects and was created with the intension of utilizing it to imitate Dos amusements and systems on linux frameworks. You may be asking why I picked Dosbox in place of Wine, well thats since wine can't handle dos programs like Turbo C++, and I would say wine is overwhelming on the framework as it is essentially implied for Windows based projects. 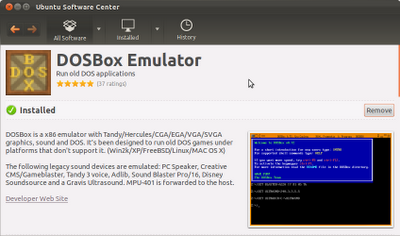 Download DOSBox Emulator from USC [Ubuntu Software Center]. This will start the setup of Turbo C++. 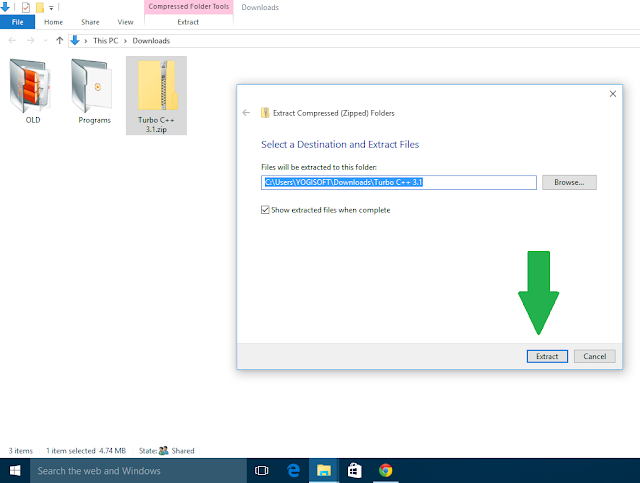 Here choose the destination drive as c and source path as setup in the next window. 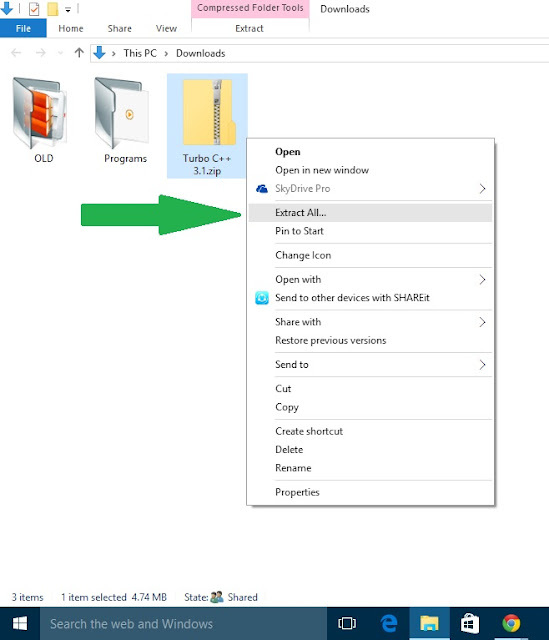 Select "Start Installation" in the below window. Step 3) Creating auto-mount and emulating in fullscreen. 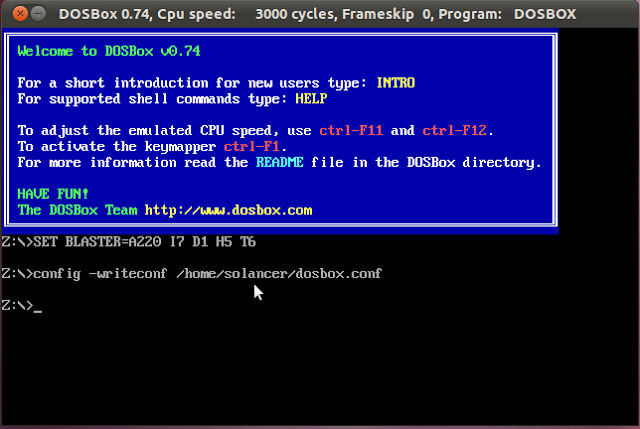 Open dosbox.conf that we created earlier in any text editor, which you will find it under home/your-username, and configure DOSBOX for auto-mount. Add the following lines at the end of the configuration file as shown in the above highlight. 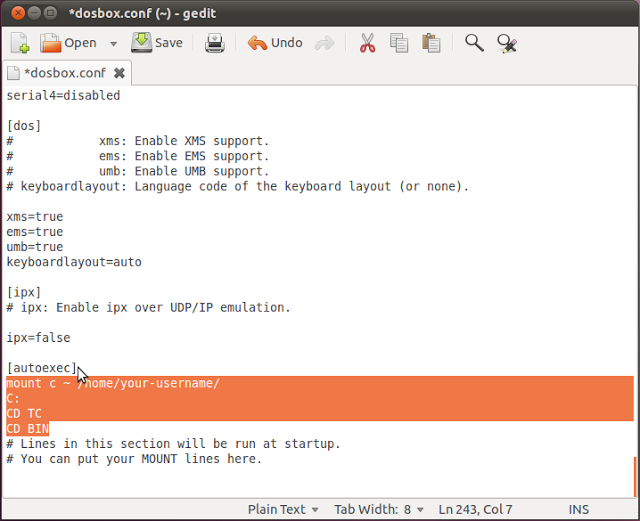 Now you are done setting up the configuration file for Dosbox to auto-mount and emulate in fullscreen. Save the file and close it. Since Ctrl+F9 is a Shutdown key in Dosbox you may feel very irritated with it, as the same key is used to compile a program in Turbo C++. To work-around this issue, open dosbox and hold Ctrl+F1. Now in the window, select theshutdown option on the right hand side bottom, click on delete and then save and exit. 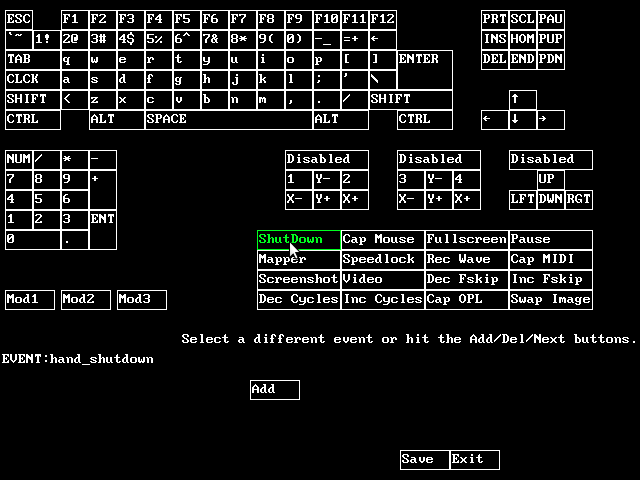 This should remove the keymap to Shutdown DOSBOX. 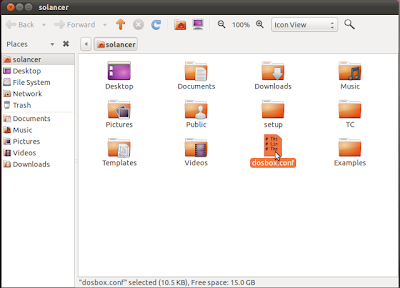 Right click on the desktop and select create launcher. 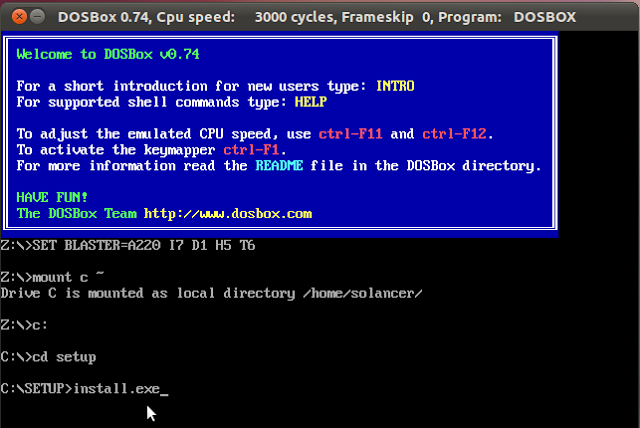 Note: Since we have set Dosbox to open in fullscreen you may consider the Alt+Enter key to use it under seamless mode . Many colleges still use turbo c++ software to teach c language. But when it comes to newer operating systems like Windows vista and windows 7 it won’t support. Reason is turbo c++ is 16 bit compiler and it runs perfect on old operating system like xp but having some compatibility issue with windows vista and 7. There are many other compilers available for C language. But most of the student use TC due to their curriculum. We can use DosBox to run TC on Win vista and 7. But it is not fully supportable. We could not run graphic code and also it won’t work with 64 bit os. 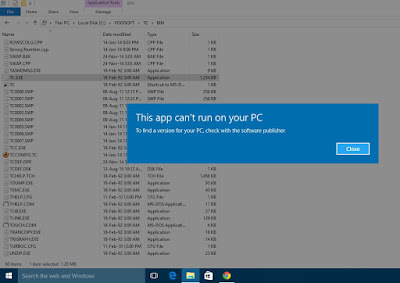 So we cannot able to work tc in newer operating systems. 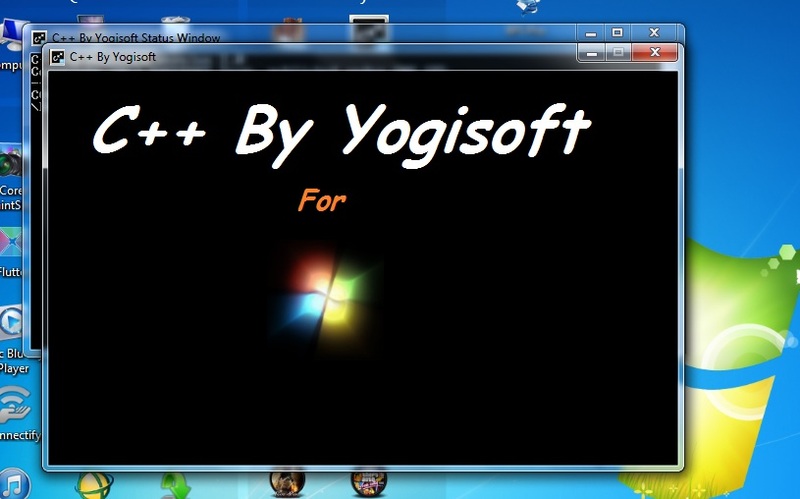 So here is solution for that, with the help of C++ by YOGISOFT software. Now we can work on Turbo C fine in win vista and 7 64 bit. 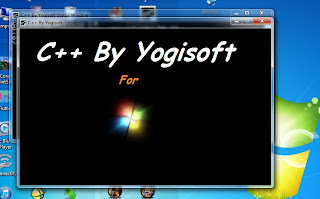 C++ by YOGISOFT design in a way that we don’t need to configure anything and it is one click installer . Installation of this software is easy just follow the instructions. It’s like next-next-finish. 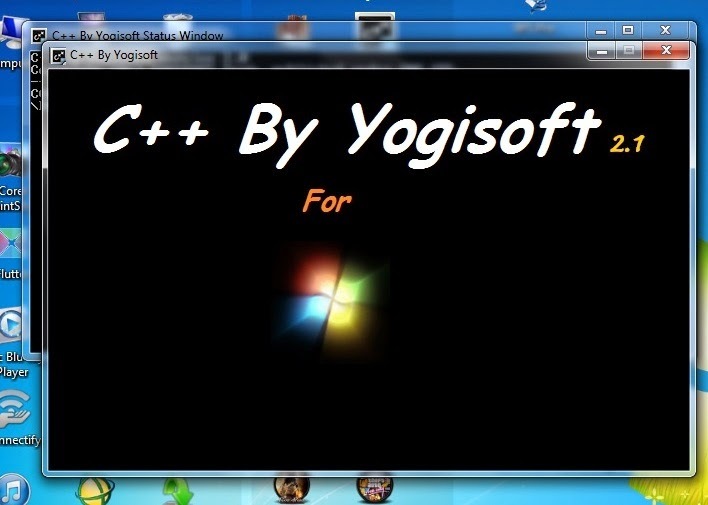 Now open the C++ by YOGISOFT from desktop shortcut. 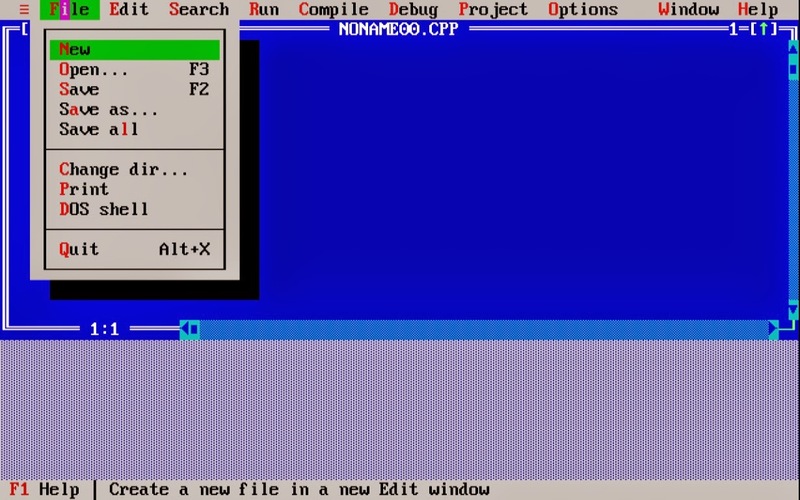 Turbo C opens in Full Screen Mode. Use "End" Key for Instant Exit. Use Alt+X to restart by typing tc again. 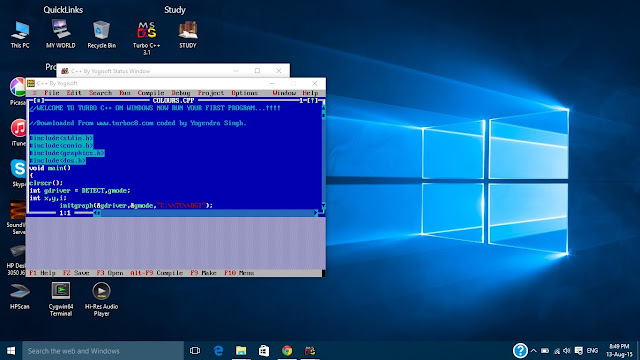 Solution all of your problem like How to run C and C++ programs on 64 bit system, How to run C and C++ programs on windows 7, How to run C and C++ programs on windows 8, how to run turbo C on windows 7, how to run turbo C on windows 8, run C and C++ programs on 64 bit system, run C and C++ programs on windows 7, run C and C++ programs on windows 8, run turbo C on windows 7, run turbo Con windows 8, turbo c for windows 7, c for windows 7, c for 64 bit, c for 64 bit, how to use dropbox, c for windows 7, c for windows 8.1 etc. Turbo C/C++ is a MS-DOS console based Integrated development environment (IDE) Compiler for learning C and C++ languages. It was also the most used compiler by tyros, since all the coder beginners of 19's had only the choice to use Turbo C/C++ Compiler for their coding purposes . 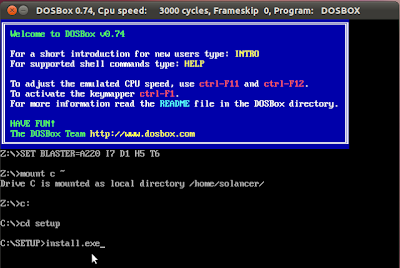 MS-DOS may be obsolete Outdated now, nonetheless its IDE i.e Turbo C/C++ 3.0 via Borland is as of now being utilized. Most of the schools and universities in Asia still instruct their understudies on Turbo C/C++.It is thought to be an easy to use and appreciate IDE since it is focused around DOS. 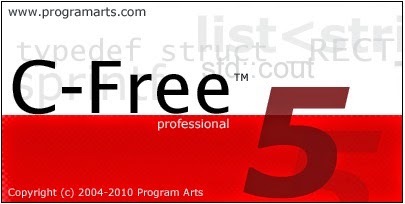 It is a most simplest compiler I ever had used to utilize and begin learning programming.
" Frankly talking, it is a most easiest compiler one ever had used to start learning programming. I was also taught my first programming Code (C++) in Turbo C."
A lot of people asking me how to install Turbo C/C++ on window 7 since they all are facing the same compatibility issue . So here is Answer for that, with the help of Turbo C++ by YOGISOFT Installer. we can work on Turbo C in the latest versions of windows be it a windows 7 or windows 8.1.
is all about the people who are looking for the latest compatible version of Turbo C++ 3.0 which is the registered trademark of Borland Corporation. This site is among un-official, non-profit, fan-sites hosted on google & dedicated to Turbo C++ 3.0 and is not affiliated to it, its record company or management. No copyright infringement ever intended. Hope you will like the Contents of the Blog. Please do leave your precious Comments & Feedback on relevant posts and on whatever you look at. Praise welcome, Criticism treasured. Better bookmark this website for lastest Turbo C++ for Windows 8 , C++ Programs , C++ Projects and rest C++ world. Don't forget to share it with your Friends ! and Like Us.. Anytime ! just drop by & hang out. . .
All Terms & Rights Reserved.